When it comes to your local gluten-free shopping in Orlando, the stores I mainly rely on are Whole Foods Market, Hoover's Market and local farmers' markets. While other health food stores exist in the area, those three are the vast majority that seem to have the greatest selection to fit my needs. While going vegan does not necessarily mean going gluten-free, I thought the gluten-free selection was well curated and was happy to see products I normally trek across town to pick up at the Whole Foods on Sand Lake Road. Artichoke Red would be a great place to keep in mind if you need a last minute meal ingredient close to home. 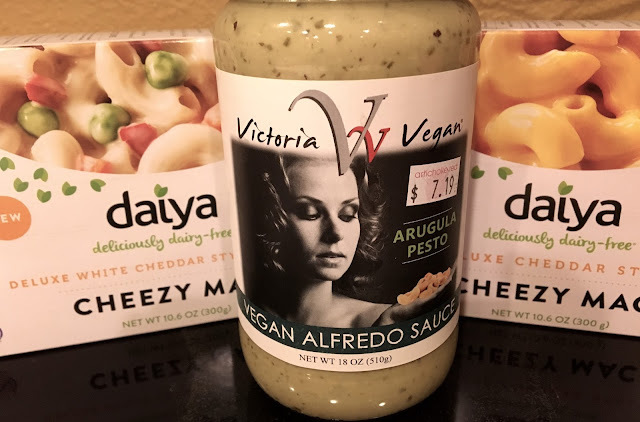 I came home with a familiar favorite- Cheezy Mac- and a new find, vegan pesto alfredo sauce (made with cashew cream) to try. When I was checking out, I asked about how long Artichoke Red has been in business. It turns out that they've been up and running for six years now. I'm amazed it's taken me this long to discover this vegan foodie gem! If you're in the area, it's definitely worth a stop. Disclaimer: This post is based upon the information I have at the time of the publication and does not reflect changes in availability of items. Please contact the Red Artichoke directly for up-to-date information and feel free to contact me with any questions or comments. I was not compensated for this post and it is a reflection of my personal opinion.